One man’s trash is another’s treasure, or in my case, his trash is my container garden. It started two years ago with an experiment. 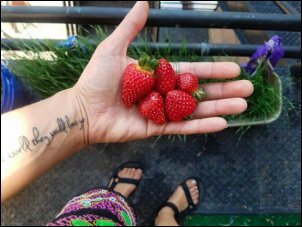 The first part of the experiment was to eat on $40/week from the Farmer’s Market (no more grocery stores), which is another story entirely. 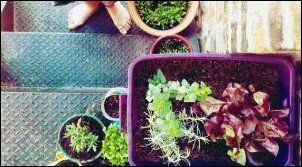 The second half of the experiment was to grow supplemental food and herbs at home, home being a HUGE loft apartment, but with no backyard or any grass or soil to speak of. I’m blessed with a fire escape, and one indoor skylight, but to be completely honest, I was NOT blessed with a green thumb. More of a black thumb, really. Nevertheless, I was experimenting. If I, the Great Killer of Plants, could manage to grow at least a few herbs, the conclusion of this experiment would be that surely, anyone could do this. I had experienced one case of a basil plant not dying, so that was a great start. I had heard talk of tomatoes being grown upside down, and a co-worker had assured me that, despite my personal dealings with rosemary, that it was quite easy to keep alive. I liked strawberries, too, and wanted to give cucumbers a go. But where was I going to plant these foodstuffs? A single woman on a budget can’t just go buying potting containers willy-nilly. One’s finances must be considered, and it seems a waste to spend a lot of money in the process of trying to save money, with the possible outcome of a lot of dead or dying plants. So I took my efforts to the alleys. Now, there are a lot of downsides of being a wilderness-minded person living smack dab in one of the most active neighborhoods of Chicago. But there are upsides too, and one of those is that the alleys are chock-full of FREE STUFF. Buckets and storage containers, pallets, and one door-hanging shoe organizer that looked like it had some potential, for starters. If you’re willing to put in the effort of a few blocks worth of hunting (before trash pickup day, of course), rather than handing your hard-earned cash over to a garden supply store, you can find plenty of “gardening supplies” for free. 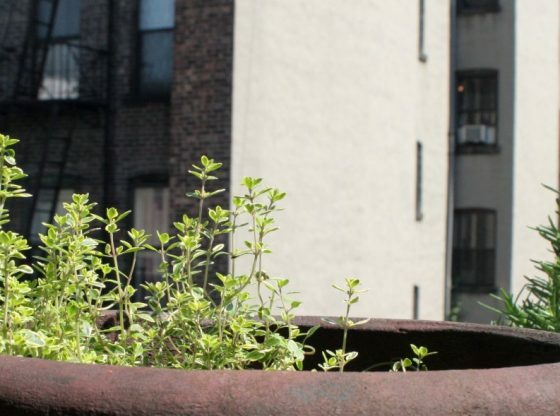 If you’re willing to sacrifice attractiveness in your potting containers, you will be delighted to find that the alleys are a great place to find, simply, things that hold things. It’s all you need, really. A basic container that can hold soil, and about a foot or more of soil. I hung the shoe organizer on the exterior brick wall of my building. I lined the buckets down the stairs of my fire escape (making sure to leave at least two feet of the stairs unencumbered, for the escaping of possible fires, of course). The storage containers were hung on the outside of the railing, held up by ropes and bungee cords. One large storage container, reserved for herbs and honeybee-attracting plants, was placed right outside of my back door. It wasn’t gorgeous, but it had potential. I drilled holes in the bottom of the buckets and storage containers, more or less depending on what was going to be planted in it, taking into consideration drainage needs. I filled the shoe organizer pockets with soil, assuming that any drainage would be taken care of by the canvas back (the pocket fronts were plastic). As I planted each pocket of the shoe organizer, I made a note of what was where in my garden notebook. Never having grown anything before, I couldn’t guarantee that I would know what was popping up out of the soil if and when it took the notion to grow. One storage container was filled with rosemary, two types of basil, lavender, bee balm, sage, and honeysuckle on a whim. 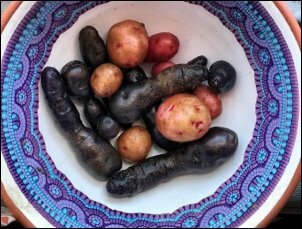 A 5-gallon bucket received the sliced-off eyes of potatoes that were sprouting on my countertop. Cucumber seeds were planted in another storage container, under a trellis made from a lighter pallet, attached to the brick wall. The shoe organizer received mustard, various small peppers, more basil, and more bee balm. Strawberries were planted in hanging baskets that hung off the railing. A long planter was filled with wheat seeds. All of this began in April. With anticipation and hope, I left my fire-escape garden in its benefit of full sun, watering just a bit every day (unless I was relieved of this chore by a nice morning rain), and waited to see what would happen. And would you believe, it worked! Well, not all of it. The honeysuckle was little more than a wish with a touch of homesickness, and nothing ever came of it. The pepper seeds, it turns out, were not viable from the get-go. But the strawberries, the cucumbers, for goodness sake, the POTATOES? They shot up, they flowered, they grew into food! A random tomato plant, perhaps a gift from an overhead bird, surprised and delighted me when it popped up in a bucket of less than fruitful turnips, and I was more than happy to give up one for the other. The cucumbers dripped off of the trellis I had built for them, and were turned into delicious pickles. 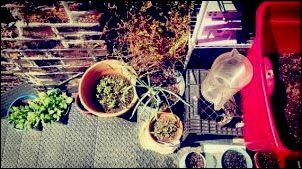 The bee balm was so popular with my rooftop honeybees (yet another story for another day) that I could sit in my the fire-escape garden with my morning coffee, and keep company with dozens of happy, hungry bees at a time. I plucked a few strawberries every morning to slice up with my breakfast. Every time I baked a chicken, I had fresh rosemary to season it with. The experiment was a success! I certainly wasn’t a farmer yet, but I was enjoying the fruits of my labors, nonetheless. The point had been proven—if I could do it, certainly anyone could. I drilled about a dozen or so small holes into the bottoms of containers or buckets holding plants that needed less drainage, 20-30 holes in those that needed more. If the weather report called for rain, I didn’t water them, but if not, I watered in the morning, enough to see that the soil was thoroughly wet. All of these were in full sun for most of the day, so I wasn’t shy about how much water they got. I started the majority of my seeds inside, using cardboard egg cartons. I kept them in a sunny window, some of them covered with a plastic container to keep them warm through the extended Chicago Winter, also known as Spring in most other parts of the country. I bought one rosemary plant and one basil plant in the early summer, the others were started from seed, and both grew equally well. I fortified my store-bought soil with homemade compost.